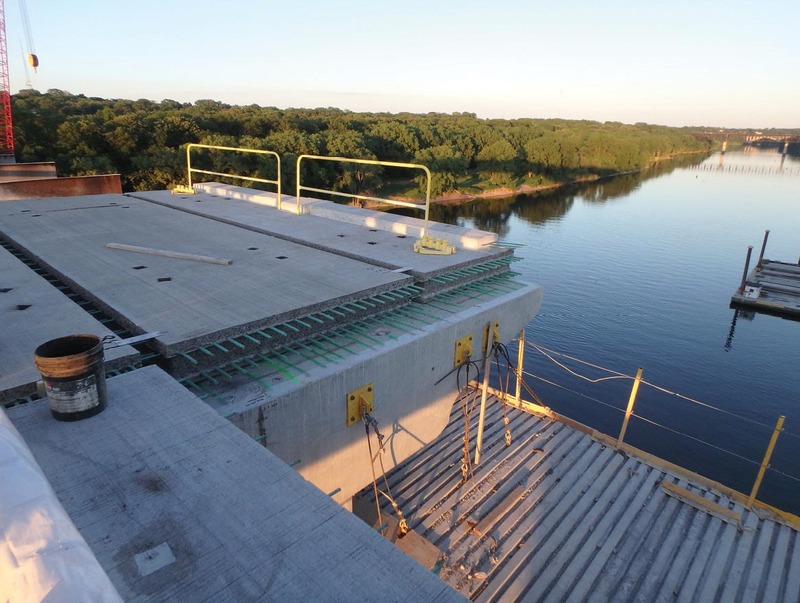 The use of ultra-high performance concrete (UHPC) to make better field-cast connections between prefabricated bridge elements (PBEs) is advancing across the United States. Transportation agencies have used UHPC on more than 100 bridge projects since the Nation’s first bridge incorporating UHPC was completed in Iowa in 2006. Half of those bridge projects were built after the Federal Highway Administration began encouraging deployment of UHPC connections for PBEs through Every Day Counts (EDC) in 2015. “We’re promoting UHPC to help make prefabricated bridge element connections simpler, stronger, and more durable,” said Mark Leonard, structural engineer at the FHWA Resource Center and a leader of the EDC round four (EDC-4) UHPC team. UHPC connection details make using PBEs simpler and more effective for accelerated bridge construction. Credit: Hennepin County, Minnesota. As a result, 14 States and the U.S. Virgin Islands have expressed interest in using UHPC connections and are learning more about UHPC. Nineteen States, Federal Lands Highway, and Washington, DC, are demonstrating and assessing the use of UHPC connections in bridge-building processes. Four additional States—Georgia, New Jersey, Pennsylvania, and Rhode Island—have made UHPC connections a standard practice on bridge projects with PBEs. PBEs—structural components built offsite and moved to the project location for installation—shorten onsite construction time, enhance safety, and offer superior durability. Field-cast UHPC creates connections between PBEs that use less concrete for the connections and provide better long-term performance than typical connection designs. UHPC’s mechanical properties allow for redesign of common connection details in ways that promote ease and speed of construction, making PBE connections simpler and more effective. 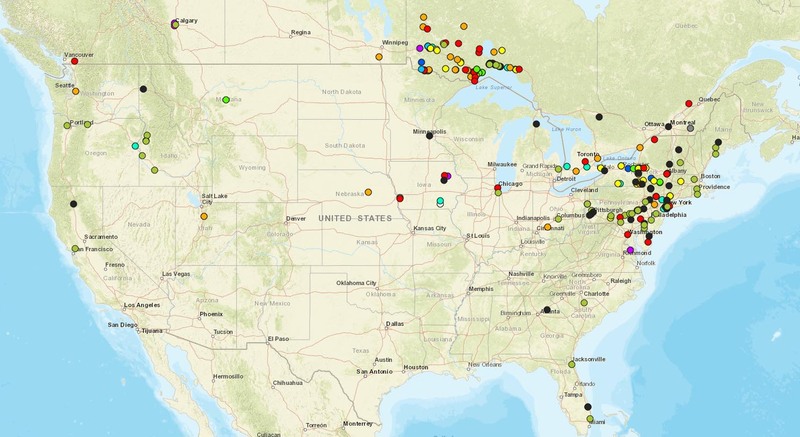 See an interactive map of transportation projects built in the United States and Canada using UHPC. Transportation agencies are exploring various uses of UHPC to improve bridge projects. The Delaware Department of Transportation (DelDOT), for example, completed the Nation’s second bridge deck overlay using UHPC on the Blackbird Station Road project in New Castle County, showing that UHPC can be used to produce a long-lasting, maintenance-free bridge deck. DelDOT also used UHPC to connect the adjacent box girders on the project, which received Accelerated Innovation Deployment (AID) Demonstration funds. The Illinois Department of Transportation is using prefabricated deck panels with UHPC connections on an AID Demonstration project to reconstruct the Campground Road Bridge over Interstate 57 in Jefferson County. The bridge will have increased load-carrying capacity and will enhance safety by providing a wider roadway and more clearance over the interstate. The Iowa Department of Transportation (DOT) is the lead State on a pooled fund research project to develop a structural design guide for UHPC. Last December, the Iowa DOT published new standards for adjacent box girders, including material and construction specifications for UHPC. The New Mexico Department of Transportation (NMDOT) is monitoring the performance of a UHPC girder bridge and is designing another four projects that will use UHPC for connecting PBEs. NMDOT is also conducting research on UHPC bridge deck overlays and applying State Transportation Innovation Council Incentive funds to develop an overlay mix design using local materials for UHPC to integrate into specifications. View an EDC-4 Innovation Spotlight video on UHPC connections for PBEs. Watch on-demand webinars on UHPC. See FHWA’s UHPC Web page for information on projects and research. See a checklist on inspection procedures for the construction of UHPC connections. Contact Ben Graybeal of the FHWA Turner-Fairbank Highway Research Center or Mark Leonard of the FHWA Resource Center for information, technical assistance, and workshops. Integrating NEPA and permitting processes can help achieve effective and efficient delivery of transportation projects. Transportation projects can require multiple permits and reviews under the National Environmental Policy Act (NEPA), in addition to reviews under laws such as the Clean Water Act, National Historic Preservation Act, Endangered Species Act, and General Bridge Act. In a linear review process, agencies conduct separate environmental reviews for a project and develop separate documents with little coordination among agencies. These sequential reviews can result in delayed identification of key permitting issues and duplicative efforts. Now, under Every Day Counts round four (EDC-4), the Federal Highway Administration is helping States integrate NEPA and permitting processes, which allows various environmental reviews and permitting procedures to be performed concurrently. The resulting synchronization provides for more effective and efficient regulatory reviews, leading to projects with reduced impacts on the environment and savings of time and money. More than 20 States now use some form of synchronization, says Mike Ruth, FHWA ecologist and leader of the EDC-4 team. The goal is for 30 States to implement synchronization processes this year. Synchronization improves the efficiency and effectiveness of the project development, mitigation, and decision-making process, Ruth said. It also reduces the time and complexity of project development while ensuring projects receive the appropriate coordinated review. In the past, several processes overlapped between NEPA and other environmental reviews, such as project plan and schedule, purpose and need, alternatives analysis, preferred alternative, and public comment period. Now, the project sponsor’s development of a purpose and need statement, for example, can be coordinated with the U.S. Army Corps of Engineers (USACE) to meet both agencies’ requirements. As examples of how agencies are making processes more efficient, the South Carolina and Iowa Departments of Transportation are developing a new application of the NEPA and Clean Water Act Section 404 (NEPA/404) merger agreements for environmental impact statements, environmental assessments, and categorical exclusion-level projects. Typically, NEPA/404 merger agreements are applied when projects require compensatory mitigation for impacts to wetlands and streams. The benefits of these merger agreements include increased trust between transportation and regulatory agencies, improved predictability, and shorter project delivery timeframes, often with more reliable and better environmental outcomes. “Ideally, the merger agreement makes obtaining a 404 permit a faster and more reliable process. This is because the USACE, U.S. Fish and Wildlife Service, Environmental Protection Agency, Iowa DOT, and FHWA have been coordinating on the NEPA document from very early in the process,” said Mike LaPietra, environment and realty manager in FHWA’s Iowa Division. “By the time the permit application goes to the USACE, these agencies have already agreed on purpose and need, alternatives to be considered, alternatives to be developed further for comparison, preferred alternative, and how mitigation for any impacts will be handled. There are no surprises for the USACE, and there is nothing they haven’t agreed to in terms of what is being done, where, what impacts it will have, and how they will be mitigated,” LaPietra said. At a January peer exchange, the South Carolina team got input on the draft agreement from representatives of the EDC-4 team, Illinois and Colorado Departments of Transportation, FHWA Illinois and Colorado Divisions, and USACE Illinois and New Mexico Districts. The draft document was revised, and the next step is review by FHWA South Carolina Division, SCDOT, and USACE Charleston District leadership. View an EDC-4 Innovation Spotlight video on integrating NEPA and permitting. Watch a webinar on integrating NEPA and permitting for local, tribal, and Federal land management agencies. Read the “2015 Red Book: Synchronizing Environmental Reviews for Transportation and Other Infrastructure Projects” for a how-to guide on integrating project reviews. See the eNEPA project collaboration tool for an electronic system that facilitates coordination among agencies to complete necessary permitting processes. See the Integrating NEPA and Permitting Resources Library for case studies, State agreements, publications, and presentations. Contact Mike Ruth of the FHWA Office of Planning, Environment, and Realty for information and technical assistance, including peer exchanges and workshops on NEPA/404 merger agreements. Agencies use preservation strategies as a cost-effective way to extend the service life of pavements. Investing in pavement preservation programs helps agencies extend the service life of pavements, stretch taxpayer dollars, and achieve smoother, safer roads with the need for fewer repairs. Not only is preservation six times less expensive than rehabilitation, it requires fewer resources. The Every Day Counts round four (EDC-4) initiative on pavement preservation (when, where, and how) offers strategies to make pavement preservation a key part of sustaining highway infrastructure through whole-life investments. The “when and where” component of the initiative promotes a network-level approach to managing pavements. With assistance from the EDC-4 deployment team, 11 States, Puerto Rico, and Washington, DC, are developing implementation plans and learning more about when and where to apply pavement preservation treatments. Fifteen States and Federal Lands Highway (FLH) are demonstrating and assessing the when and where component, and 22 States have made it a standard practice to manage pavements proactively. On the “how” side, the EDC-4 initiative encourages agencies to explore the range of quality construction and material practices available to preserve pavements. “Although there are a number of proven practices, many States limit preservation activities to just one or two treatments,” Dietz said. Eight States, Puerto Rico, and Washington, DC, are developing implementation plans and learning more about how to apply pavement preservation treatments. Ten States and FLH are demonstrating and assessing preservation treatments, and 26 States have institutionalized the use of quality construction and materials practices to preserve pavements. 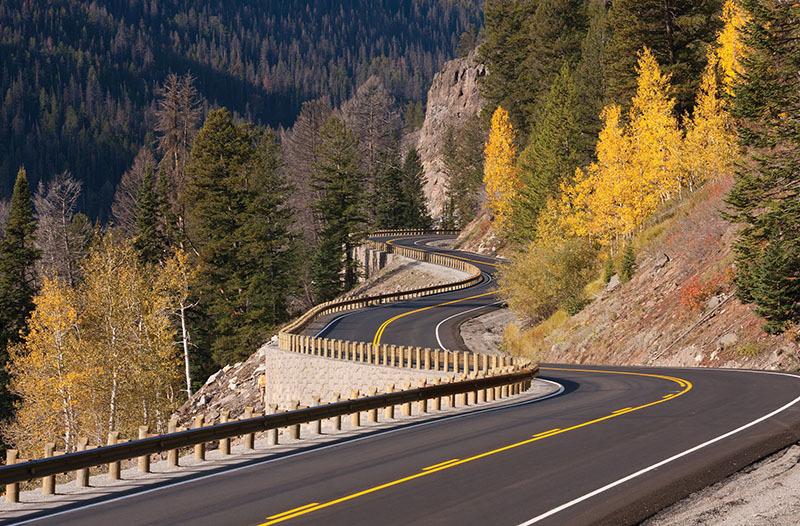 Across the country, State and local agencies are using pavement preservation strategies to sustain infrastructure cost-effectively. The Connecticut Department of Transportation (CTDOT), for example, completed seven pavement preservation treatment projects totaling nearly 56 two-lane miles of roadway under its pavement preservation program. CTDOT saved on resources and expedited implementation by combining several projects in a competitive bid contract instead of bidding by project. Using this method enabled CTDOT to complete more projects in less time. Elmore County, AL, uses a 100-point scale to grade its 800 miles of paved roads every 2 years and applies preservation treatments such as fog seal, slurry seal, microsurfacing, and cape seals to improve the road network over time. 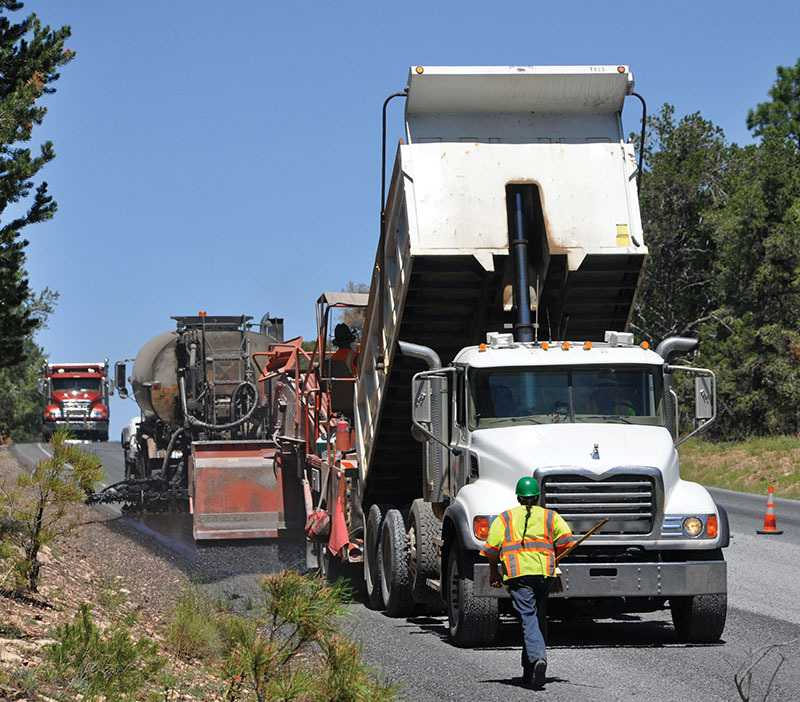 In 2018, 80 percent of the county’s paved roads were graded at 80 or above, compared to 45 percent in 2004. The Mississippi Department of Transportation (MDOT) is evolving its pavement data collection process from statistical sampling with visual assessments to automated collection on interstates as well as two- and four-lane routes. A new pavement management system will enable MDOT to use historical pavement condition data to implement strategies for targeted maintenance and preservation and forecast future conditions. MDOT’s process includes decision trees to indicate the timing of and investment in preservation treatments needed to yield the lowest life cycle cost. The New Jersey Department of Transportation (NJDOT) is exploring new pavement preservation treatments, developing specifications for them, and monitoring their performance. NJDOT plans to construct two ultra-thin bonded wearing course projects and evaluate them for constructability and performance. NJDOT also plans to use an ultra-thin paver on several high-performance thin overlay projects. The paver will spray a polymer-modified tack coat in front of the asphalt mixture, eliminating tracking issues associated with standard tack coat application and increasing bonding of the thin overlay to the existing pavement, resulting in superior performance. View an Innovation Spotlight video on pavement preservation. Read the Missouri Department of Transportation’s “Concrete Repair Best Practices,” a report consolidating case studies from several States on six concrete pavement restoration techniques. Also see technical briefs for each technique: cross-stitching, dowel bar retrofit, diamond grinding, full depth repair, partial depth repair, and slab stabilization. Visit the FHWA Pavement Preservation and Asset Management websites for resources. For information and technical assistance on pavement preservation, contact Jason Dietz of the FHWA Resource Center, Thomas Van of the FHWA Office of Infrastructure, or Antonio Nieves of the FHWA Office of Asset Management, Pavements, and Construction. Members of the State Transportation Innovation Council (STIC) network are ambassadors of innovation in the effort to drive better project delivery, says Acting Federal Highway Administrator Brandye Hendrickson. STICs turn breakthroughs into mainstream practices by bringing together transportation practitioners and decision makers from the public and private sectors to determine what innovations could work in their States and implement strategies to deploy them. On a North Dakota pilot project, an acoustical fiber that serves as a traffic sensor is buried on the side of the road. Credit: North Dakota Department of Transportation. Held twice a year, national STIC meetings provide a forum to share innovation best practices and to learn how other States are using new tools and techniques. The April meeting focused on a North Dakota Department of Transportation (NDDOT) pilot project on the use of fiber optic roadside monitoring to optimize traffic operations, an innovation with potential for application elsewhere in the country. 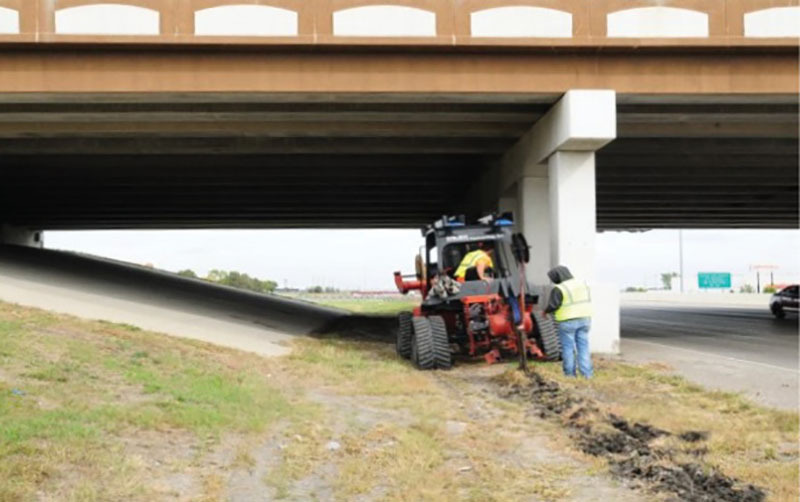 The first of its type in North America, NDDOT’s distributed acoustic sensing (DAS) system allows for continuous acoustic measurements along the length of an optical fiber buried close to the road shoulder. The test system, located on Interstate 29 in Fargo, is capable of monitoring traffic speed, travel time, and volume in real time. The test system is 4.5 miles long, including ramps and both sides of I-29. The fiber itself is the sensor, replacing a variable number of conventional point sensors. The distributed acoustic sensing test system is controlled by a computer, which is hooked up to a speaker system with a subwoofer because most of the detectable auditory output is in the low range. Credit: North Dakota Department of Transportation. Installing the fiber involves minimal traffic impact. The fiber is buried close to the shoulder to maximize the signal and is bored across the road where traffic counts are desired. The fiber is buried 2 feet below grade to minimize impacts from road work and environmental noise. 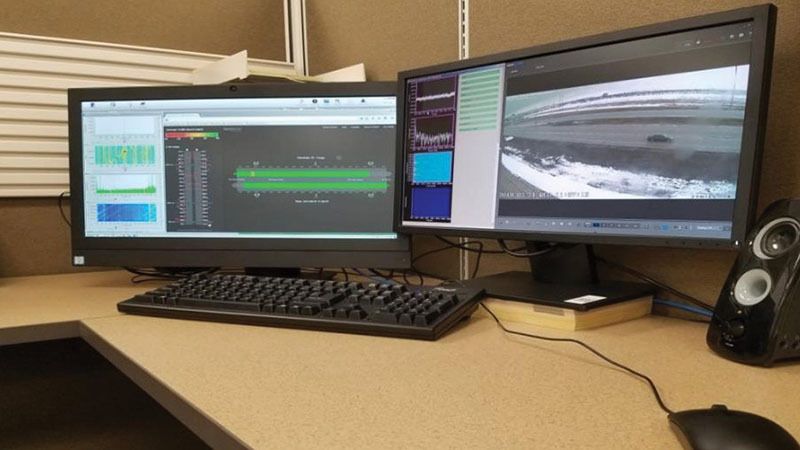 The DAS system control unit, located at the NDDOT central office in Bismarck, provides operators with speed updates every second and travel time between interchanges. A prototype algorithm measures traffic volumes at nine locations, indicating vehicles per minute, vehicles per hour, and vehicles in the last hour. Tony Furst, FHWA chief innovation officer, thanked meeting participants for their work to deploy the innovations in Every Day Counts round four (EDC-4). EDC-4 Progress Report #2 summarizes innovation deployment halfway through the 2-year cycle. “Our collective ability to document outcomes is a key element to the success of this program,” said Furst. Furst also thanked participants for offering suggestions on new technologies and practices to promote in EDC-5, which kicks off in January 2019. FHWA will hold five innovation summits in the fall to enable transportation leaders to discuss implementation of the EDC-5 innovations. For information on North Dakota’s DAS project, contact Ethan Akerly of NDDOT. For information on the STIC network, contact your State STIC network or Sara Lowry of CAI. To explore these questions, A.I.I. and FHWA organized the “Innovation Forum” in Columbus, OH, in March that drew DOT innovation officers from California, Delaware, Kentucky, Minnesota, Missouri, North Carolina, Ohio, Pennsylvania, Texas, Utah, Virginia, Wisconsin, and Wyoming. Although their titles and position descriptions differ, participants found that they have a common responsibility to encourage, deploy, and share innovations throughout their DOTs. Jason Siwula, innovation officer and assistant State highway engineer for the Kentucky Transportation Cabinet (KYTC), provided an overview of National Cooperative Highway Research Program Project 20-108, which is a guide for transportation officials who want to create or sustain a culture of innovation. He also discussed how KYTC is implementing suggestions developed through the project. Learn about the project and read the guide at the 20-108 Innovation Lab website. 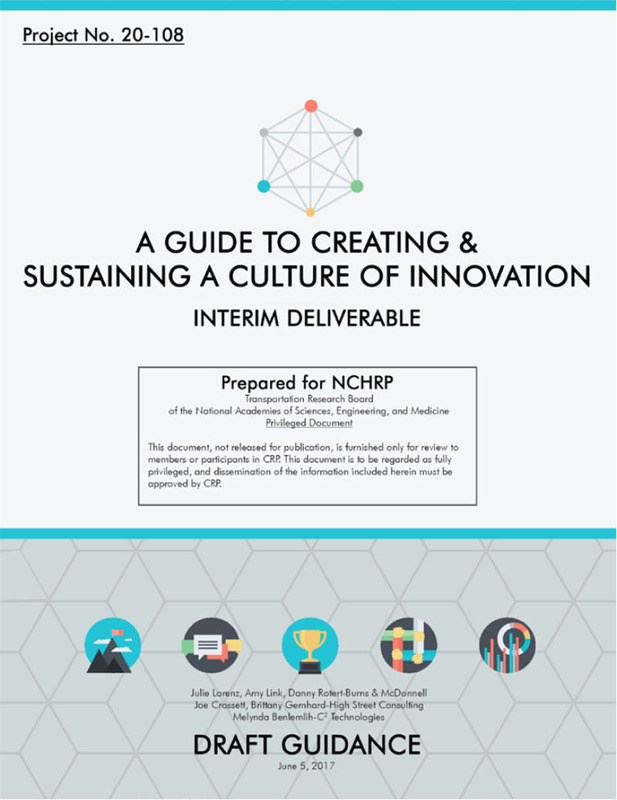 A National Cooperative Highway Research Program project developed guidance on building and maintaining a culture of innovation. Credit: National Cooperative Highway Research Program. Andrew Bremer, managing director of DriveOhio, discussed his organization as an example of a community of practice established this year to create a single point of contact for Ohio’s smart mobility initiatives. DriveOhio is a collaboration among government, research, and private industry partners to build infrastructure for smart mobility and facilitate smart mobility innovations. Get information on the partnership and its projects at the DriveOhio website. Innovation, Research, and Technology Program Chief David Esse of the Wisconsin Department of Transportation (WisDOT) gave a presentation on his “Five Steps to Innovation Bliss.” Read about the WisDOT innovation process—incubate, demonstrate, pilot, communicate, and implement—and how the agency applies it in “Capturing the Value of Innovation Investments” in the May/June Innovator. The FHWA Center for Accelerating Innovation (CAI) and A.I.I. will use the information shared at the Innovation Forum to develop innovation tools and resources. Learn more in future issues of the Innovator newsletter. Send your own answers to the questions discussed at the forum to the CAI team at innovation@dot.gov. The Colorado and Pennsylvania Departments of Transportation launched full-scale training centers for first responders in partnership with their State police patrols. Replicating a concrete interstate and other highway segments, the centers enable responders to practice strategies that improve safety and minimize their exposure to traffic hazards when responding to traffic incidents. The centers complement the classroom study of the National Traffic Incident Management (TIM) Responder Training Program, which trains police, fire, emergency medical service, towing, and transportation personnel how to collaborate, work safely, and quickly clear the roadway. The Delaware Department of Transportation (DelDOT) used State Transportation Innovation Council (STIC) Incentive funds to enhance its DelDOT App, which provides travelers with real-time traffic information. The latest app update includes text notifications of traffic advisories to help users better plan their travels throughout the State. Based on geofencing technology, the enhancement provides users with the ability to receive advisory notifications for events within a set mile radius from their location. Users can choose from a list of notifications, such as incidents, construction, congestion, road closures, events, special travel alerts, and weather. Available for free, the DelDOT App has been downloaded more than 78,000 times. View a video on the app. The Mississippi Department of Transportation (MDOT) used STIC Incentive funds to update its Construction Manual and convert it to an electronic format with links to documents used throughout the agency. The electronic conversion, part of MDOT’s e-Construction implementation effort, is an initial step toward the use of mobile field applications for construction monitoring and oversight. MDOT expects the new manual to improve the efficiency and accuracy of contract administration on projects. The electronic format will also make future updates easier. STIC Incentive funds helped the North Carolina Department of Transportation (NCDOT) implement deep compaction grouting technology and develop specifications. NCDOT used deep compaction grouting—a subsurface soil treatment—to stabilize and restore the grade of settling bridge approach slabs for dual bridges over a railroad in Cary. Ongoing settlement of the approach slabs created maintenance problems and generated driver complaints about the “bump at the end of the bridge.” Monitoring showed that minimal settlement occurred in the year after compaction grouting was used. Applying experience gained on this and three additional projects, NCDOT developed specifications for compaction grouting of bridge approach slabs and other ground improvement applications. In a first for the State, the Oklahoma Department of Transportation (ODOT) used self-propelled modular transporters—computer-controlled vehicles that carry large structures and position them precisely—to install two railroad bridge spans over Interstate 235 in Oklahoma City over a weekend. Using accelerated bridge construction to build the bridge truss structures near the interstate and move them into place reduced the impact on traffic, requiring a road closure from Friday to Monday rather than for several months if traditional construction methods were used. ODOT used DOT and railroad coordination best practices on the project, including working with one point of contact at BNSF Railway, conducting regular project status meetings, and creating a document flow chart to enhance efficiency. The bridge is part of an Interstate 235 reconstruction project.